In some organizations, the design stage induces pressure to trim the timeline or. budget in Hallstatt potential by compromise the project In the book Death March: Managing “Mission Impossible” Projects, software project manager Edward Your don defines a death march as a project in which at least one of the four parameters exceeds the norm by at least 50 percent A two-year project is optimistically scheduled for completion in 12 months or less, the staff or budget for a project is cut in half,or the features and performance requirements are twice what can reasonably be completed during the life of the project When one of the parameters is off by 50 percent or more, the likelihood of project failure is at least 50 percent As the project deadline approaches, members of the project team do triage by lowering performance standards, abandoning project objectives, or incurring increased costs to complete the project within at least one of the specified parameters activities- that should have occurred in the design stage.
. Near the enil of tile design stage, articulate a project prop-ow obit describe S the project effect in detail so that project team members and manacers are all aWaN of the protect’S scope, costs, performance standards, and time Unes . 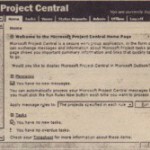 You can print some of the reports you need for the project proposal from Project 2000. Other parts of the document may be created in Word, Power Point, Excel, or other applications. Have the project’s customers and other Stakeholders sign a letter of agreement or project charter that indicates their approval for the project design, budget, and timeline. In most organizations, this is done for internal customers (the department or people the project is being done for) as well as external clients. Use the final budget and timeline information to update your project information in Project 2000 before moving into the next stage of the project.